Microsoft’s Story Remix is what happens when someone who suffered through too many dull slideshows of vacation photos thinks about what they could do better. 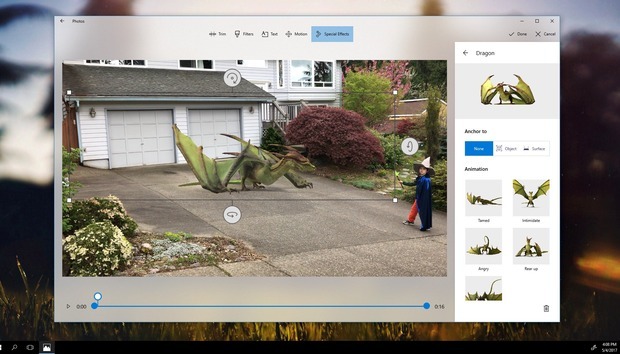 Arriving with the Windows 10 Fall Creators Update, Story Remix allows you to stitch together photos into “stories” with music, inking, transitions, and even make-believe 3D objects to liven them up—or Story Remix might just do it for you automatically. Custom music supplied by Microsoft’s Groove Music service syncs to the transitions, and you have total control over filters, transitions, and more. Unfortunately, several of the app’s coolest features aren’t actually available yet, even to members of the Insiders program. These include the ability to add 3D objects to a scene, which will arrive in a future update, I’m told. How will you know if you have access to Story Remix? If you’re not part of the Insider Program, you’ll receive the new app when the Windows 10 Fall Creators Update rolls out this autumn, most likely in September. Otherwise, the tipoff is the new tab names at the top of the app: Explore, Create, and Folders, which replace the older “Collections, Albums, Folders” hierarchy. I haven't seen a search box yet in the Remix 3D app, but the custom slideshows in the very top row are present. In the current Creators Update, you may already notice Photos sending you notifications that it has “created a story” for you, based on Photos you took on a certain date. That “story” is just a page of photos. Story Remix goes a step further, with a “Created for You” collection at the top left-hand corner of your screen. Inside you’ll find an algorithmically-created slideshow made of photos Story Remix finds interesting, each with a bit of variation: a slight pan across, a bit of motion. This is where Story Remix really kicks off. For now, all I’ve seen of Story Remix involves creating slideshows. Story Remix collects relevant photos and puts them into a short slideshow which you can play, edit, and share. Open the slideshow, and you’ll see an editing screen: the collection of photos on the upper left, the slideshow-in-progress to the upper right, and the timeline of photos underneath. Naturally, you’ll have the option of adding and subtracting photos, and you may reorganize the timeline as you wish. Slightly above the timeline, you’ll see even more options: you can lengthen the time a photo appears onscreen, affect how it moves, add an image filter, or even add text. You can also add ink, of course, with the Surface Pen or another stylus. Don’t be confused by the numbers attached to each photo—they’re not the file size, but the number of seconds each photo appears on the screen. Why is a photo on screen for exactly 3.43 seconds? Because of the Story Remix beat matching. Story Remix can tap into Groove Music for a soundtrack. Because you just can’t tell a proper story without music, each slideshow Story is usually accompanied by music, supplied by Groove. Photo transitions happen on the beat, to give it a bit more pop. You’ll have the option to choose from different themes, or create your own soundtrack from an existing Groove Music subscription. Microsoft representatives also say that the music will adapt itself, looping to fill the available space. Oh, and why do they call it Story Remix? Because if you simply don’t like the way it turned out, you can click the “Remix” button and Microsoft will automatically redo the whole thing. One of most exhilarating moments during Microsoft’s Build keynote was when the presenter stitched a virtual 3D fireball to an object inside a video, a soccer ball that a player kicked into the net. That’s amazing—a free app that can recognize an object in a video, and then superimpose another object on top of it, tracking it as it goes. Don’t get too excited, though, as stitching isn’t currently part of Story Remix. As with Paint 3D, a Remix 3D sidebar opens, offering access to community-created content. It’s damned impressive, though. Remix 3D, the community art site that Paint 3D taps into, now includes animated 3D objects. In a live demo inside Microsoft’s booth, the presenter used a raw video of a boy waving a wand in his driveway. Each animation can have an “intro” and an “outro,” so that the lightning bolt that was stitched to the wand flared, casting a stream of magical energy toward the dragon, then fading away as the dragon yielded to the boy. Within the current Creators Update, you can ink a note on a video, and that ink will persist for a few seconds. You’ll have greater control over the duration of that ink or text in Story Remix, and eventually assign ink to “track” an object or person. Just not yet. While I wouldn’t go so far to say that Microsoft has a credibility problem, there is a nagging concern that some of the amazing features Microsoft demonstrated will never see the light of day. We watched a polished Capture 3D app debut last fall. Whether that was axed as part of the apparent demise of Windows Mobile, I don’t know. But it still hasn't shipped. I’d also like Microsoft to start thinking hard about its algorithmic slideshow generation. Its chief competitor here is Google Photos Assistant, which spontaneously creates slideshows and sets them to music, too. Just this week Photos automatically pulled a number of untagged photos of my youngest son and created a “They Grow Up So Fast” slideshow. That’s the kind of thing that surprises and delights customers. Designing tools to facilitate creativity is a wonderful ambition, and Microsoft looks like it’s on to something here. I think many people don't have the time to devote to this, however, so I hope Microsoft finds ways to automate more of the fun stuff.